In this delightful graphic novel, young witch Salem Hyde and her cat companion Whammy prepare for their friend Edgar’s birthday party. Meanwhile, they are also battling their archenemy, Shelly. First, the reader gets to know Salem and her magic a little bit. She makes herself bigger and then runs out of magic before she can shrink back. 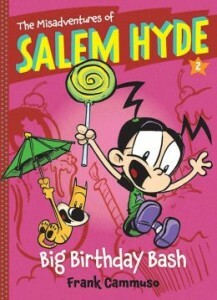 Next, Salem has to get past Shelly and the fact that she’s hidden Salem’s invitation to the party. On an excursion to buy Edgar’s present, their misadventures continue with major brain freeze from slushees and Shelly confronting them at the toy store. Plus, they have no money. When they finally get to the party, Salem does her best to make it a great day for Edgar. Of course, her spells backfire and she has to correct for some of them. She tries to make the party big but ends up shrinking the attendees instead. Whammy is almost served up as dinner to some baby birds. The lively and exciting panels pull the reader in and should hold their attention. They also provide a great backdrop to increase comprehension for second graders and up. Friendship and getting along are strong and subtle themes of this work. The author’s website, www.cammuso.com, provides information on author visits and about all his books.